Preorders of Samsung Electronics’ flagship smartphone Galaxy S8 have hit 700,000 units here since beginning last Friday, the company said Thursday. “The Galaxy S8 and Galaxy S8 Plus reached 728,000 units, as of Wednesday, in Korea. 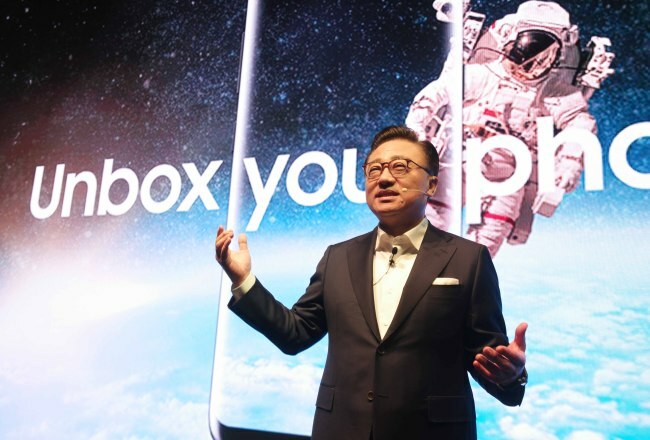 We are aiming to sell 1 million units before officially launching the smartphone,” said Samsung’s mobile business chief Koh Dong-jin at a media conference at its Seocho office building in Seoul. To create hype and boost sales, Samsung has been ramping up its marketing in recent years. During an event on March 29, Samsung covered the entire Times Square in New York with ads promoting the Galaxy S8 and Galaxy S8 Plus. The tech firm said its spending on marketing for the Galaxy S8 is at a similar level to its predecessor Galaxy S7, but with additional expenses aimed to recover its brand image following issues with the Note 7. Alongside Samsung’s largest market, the US, the company said it would make more efforts to regain its reputation in China, where Korean companies are facing difficulties amid growing political tension due to the deployment of the US’ Terminal High Altitude Area Defense anti-missile system here. “China is the market we can never give up. Although we have had a hard time over the past two years in the market, we believe Chinese consumers will react to and recognize good products,” the mobile chief said. “Although the technology development speed of the Chinese companies is very fast, we will make more efforts to achieve the performance we had in 2013,” Koh said. Samsung’s smartphones took first place in China in 2013, with an around 20 percent market share. The share dropped to 13.8 percent in 2014, 7.6 percent in 2015 and 5 percent in 2016, due to the rise of Chinese handset makers. The rollout in China is expected to be in mid-May when the virtual assistant Bixby in Chinese is ready, he said. Samsung is confident about safety this time, as it has worked to prevent the same safety problems it had for the Note 7 last year. “We carried out battery tests for more than 200,000 units of the Note 7 following the issue and more than 100,000 units for the Galaxy S8. We can confidently say the Galaxy S8 is safe for use,” Koh said. The Galaxy S8 and Galaxy S8 Plus are slated to go on sale on April 21 in Korea, the US and the UK.